Each year around the holidays it feels like we as a society have the same discussion and each time it feels like there is always a further destruction of Christmas, or as some like to call it “the holidays”. Every year this issue seems to get worse and worse. The masses flood to the stores looking for the best deals and get caught up in the consumerism of this holiday. Let’s all take a beat and remember who this holiday is really about- Santa. I mean why don’t we remember him during our time of shopping? In fact why are we even shopping? Won’t Santa bring us the things we want as long as we were good? Perhaps people are shopping because they know they were not good. After all they did forget about Santa. I know what you are thinking. “Gee-Whiz, Josh, if Santa is real why have I not been receiving coal all of these years?” Please, do you really think Santa would waste a precious commodity like coal to be who don’t even believe in him. No, the coal is for those who believe and are extremely naughty. So remember to believe in him. after all Macy’s wants you to. Why not celebrate Santa by sending the artwork above to your love ones this year. Perhaps even send a card to Santa. I’m sure he will love it. Side note: Please realize the the above is satire. I want you to celebrate this time of year however you choose: wether it is Christmas, Hanukkah, Kwanza, Festivus, or perhaps your own holiday you’ve invented. The only thing that isn’t a joke is that I want you to head over to Openme.com and buy a greeting card (preferably one of mine so I can collect some royalties). Please do not send any hate mail to me. However if you do want to send me hate mail… Head on over to Openme.com and send me one of their fine cards on sale and send me one of those. 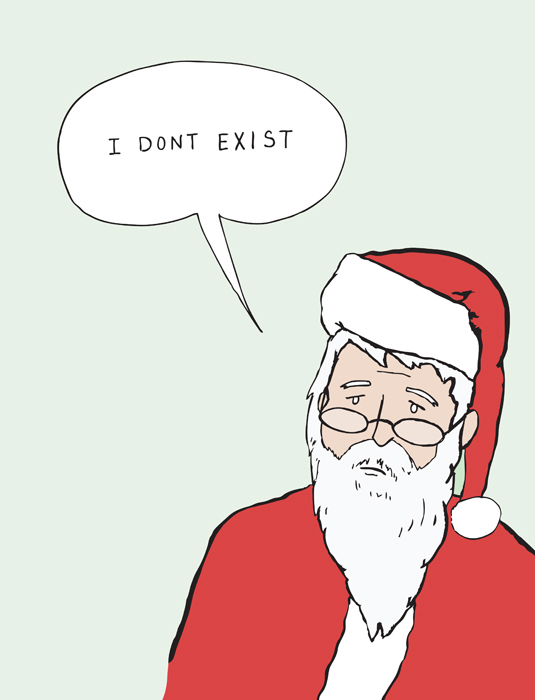 This entry was posted in Uncategorized and tagged Christmas, holiday, idontexist, sadsadsad, santa, xmas. Bookmark the permalink.